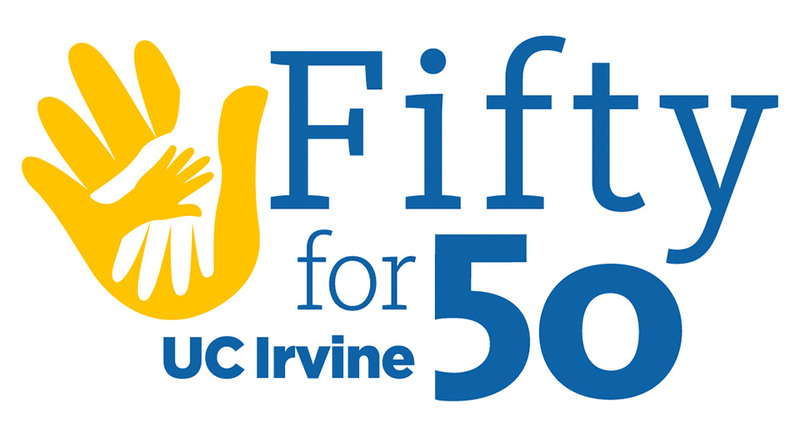 Fifty for 50 is a comprehensive effort to inspire the extended UCI family, inclusive of students, staff, faculty, alumni, retirees and emeriti, to create a better community through active participation in volunteer programs and civic engagement in honor of UCI’s 50th anniversary. Our goal is for every member of the UCI community to serve for 50 hours or more in our 50th year, and log their efforts on the UCI Get Connected volunteer website. Create a personal account online now and join UCI during our “Anniversary Week” volunteer events to get started. Come visit our table, sample a KIND snack bar and receive a smart wallet (a sleeve that attaches to your cell phone, while supplies last), as you learn about our special “Anniversary Week” volunteer events and how to log your 50 hours of service this year! Music provided by Electronic Dance Union. Too busy to volunteer? 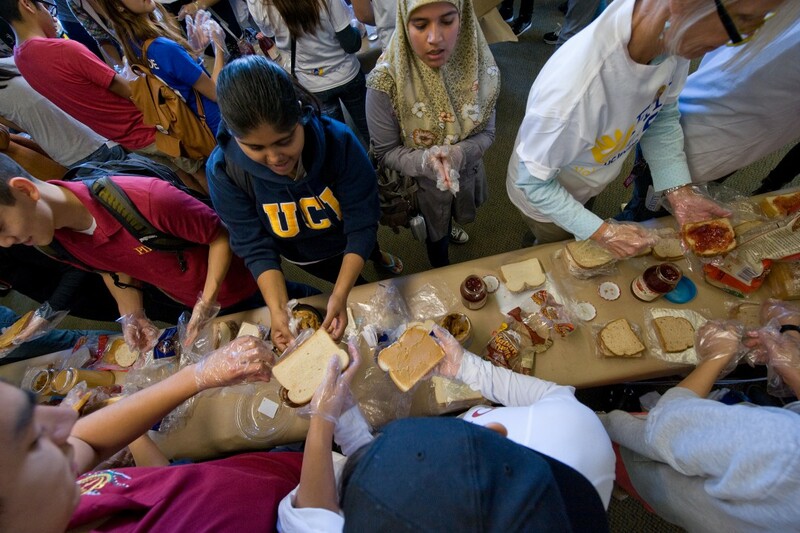 If you have 15 minutes, feel free to drop by on your lunch break and join the student group, “Anteaters Are Better Together” in their effort to eliminate hunger, one PB&J at a time! The IEF is a unique public/private partnership between the City of Irvine, the OC Great Park, Orange County Produce and Second Harvest Food Bank to solve our county’s considerable hunger problem by providing recipients with highly-nutritious, top-quality produce grown on a local farm. Your work at the IEF will consist of planting or harvesting fresh produce or assisting with farm maintenance. Transportation and a FREE t-shirt will be provided. Please sign up here. Stop by a table hosted by Veteran Services and write a note to thank active duty military veterans and their families for their service. Cards and pens are provided. Chancellor Howard Gillman and Orange County United Way President & CEO Max Gardner have brought together a group of faculty, graduate students, nonprofit leaders and community partners to develop strategies on how to improve the quality of life of Orange County residents. The event will culminate in an action plan for further collaboration. Planting the Seeds for a Better OC – 7:45-11:15 a.m. Think environmentally, act locally! Join us in an effort to support California State Parks through a volunteer project focused on preserving the native landscape in our environment. Participants will be planting native seeds and transplanting mature plants grown on the Newport Banning Land Trust site for use in Crystal Cove. Transportation and a FREE t-shirt will be provided. Email sandy@uci.edu for more details and to RSVP.